Rapture 5/21/2011– Next.. Zombies!! | What's Next God? Good evening everyone! It has been really rainy here today! Well I just wanted to come on here to say farewell. If you haven’t heard, the world is supposed to end tomorrow. Do I believe this? No. Is it possible? Yes! Am I going to stop blogging? No. If you have no clue what I am talking about, check out this news story. Now here is what is really kinda funny. 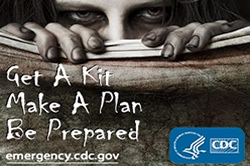 The CDC (Center for Disease Control) here in the USA has created a Prep Guide To Zombie Apocalypse. I really don’t believe in zombies. I just thought I would get your thoughts on tomorrow’s supposed events.